‘Tis the season to be jolly – the Kirknewton Christmas Festival is coming! If you take a look at the Kirknewton Development Plan Theme One, Priority 2 is to identify and promote groups/events and to increase the number of successful annual events by 2013. Already the Parent Staff Association have announced their events for 2012 (and the forthcoming Family Ceilidh at the Stables – get your tickets now!) and the Development Trust are keen for local groups to develop an annual series of events every year that make us the ‘Gateway to the Pentlands’ from the west/West Lothian and help our local economy. The first ‘Kirknewton Christmas Festival’ from 2nd to 25th December is an example of that. The idea came out of the successful Christmas tree lighting event last year (very cold, very slippy underfoot, very well attended!) and Potter Around suggesting a craft fair and the Development Trust thinking about having a traditional Christmas food fair. Instead of several individual events struggling to promote themselves why not put them all together in one tiny festival and wrap them up with a lovely christmas bow on top! So as soon as you could say ‘ho ho ho’ the school, the gala, the playgroup, Potter Around, Kirknewton church, the PSA, the Kirknewton Inn, the Allotment Association and the Development Trust (and a few others still to be contacted for help!) responded to the call and over 20 events were put forward to entertain Kirknewton folk on their very own doorstep during December. Highlights are on after the School Christmas Fair on Friday 2nd December 10.30am til 12.30pm in the school hall) you can make Christmas Cards for Mum and Dad from 1.30pm and from 3-4pm you can make fruity lip balm for you or for pressies at Potter Around, Overton Farm – entry is £10 for each Kids club. On Saturday 3rd December at 6pm there is the annual lighting of Kirknewton Village Christmas Tree. This event was very well attended last year despite the thick snow underfoot. The event is meeting from 6pm in the school playground for a 6.15pm departure with a torch lit procession along to tree at Park Terrace. Following the ‘switch on’ there is festive refreshments in the village hall. Glowsticks are available to buy in advance from Kirknewton Community Development Trust office or Potter Around. On Sunday 4th December at 2-4pm there is a Playgroup Jumble Sale in the Village Hall. Donations of kids clothes, books, dvds, CDs, and games can be made to the Playgroup from 9am to 11am week the before please. On Saturday 10th December from 12 til 3pm the Development Trust presents the ‘Kirknewton Family Christmas Craft and Food Fair’ at Potter Around. There will be craft stalls, Christmas decorations, BBQ, home baking, tea, coffee, non alcoholic mulled wine, carol singing, Santa’s grotto and special Christmas surprises. Entry is free. On Sat 17th December there will be a Christmas Tree and Table Top Sale in the School Playground. 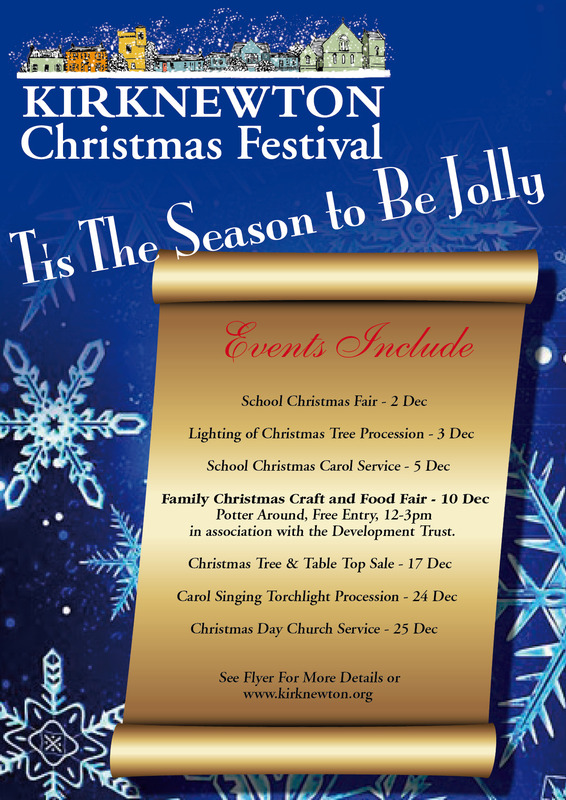 Hot drinks, mince pies and even Father Christmas will be there. Some come along to find a bargain! The following day on Sunday 18th December from 4 to 7pm there is a Christmas gig with vocalist Kenny in the Main Street Village Inn. The procession is followed at 11.30pm with the Watchnight Service in Kirknewton Church and on Sunday 25th December the Christmas Day Service is at 10am. It’s thanks to volunteers coming forward that we get things done in Kirknewton – you will hear more stories on this blog all this week. We also want to know what skills and volunteer time you do already or can offer (and we want to hear from you, even if you can’t) via our Skills and Volunteer survey that you can fill in online or on paper from various outlets in the village – it takes less than 5 minutes to fill in and we need your responses by 22nd November. Thanks in advance for taking the time to fill out the survey.